It is also marketed to be "a unique broad-spectrum probiotic powder, designed to deliver 12 species of beneficial cultures including Homeostatic® Soil Organisms, including 1 Billion CFU of Bacillus subtils plus Lactobacillus and Bifidobacterium probiotics to promote regular bowel function and immune system health." The HSO blend "helps promote healthy digestive balance, support normal absorption and assimilation of nutrients, and help maintain a healthy immune system. 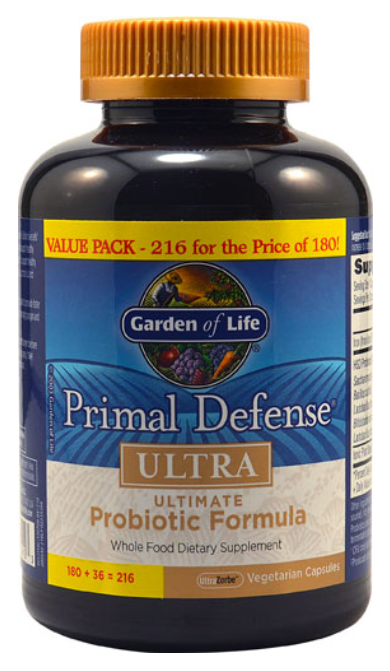 What Probiotic Strains are in Garden of Life Primal Defense HSO Formula? This supplement contains 12 species of microbes in the form of their HSO Probiotic Blend. Garden of Life stated, “The HSOs in Primal Defense are important probiotics you would get in abundance if your food came from soil untouched by pesticides, herbicides and other widely used chemicals.” But what are HSOs? Homeostasis is the tendency of something to maintain a condition of balance or equilibrium, such as the way your body is able to maintain a rather constant internal temperature of 98.6 degrees F no matter what the environmental temperature (within reason, of course.) A Homeostatic Soil Organism, then, is an organism which is from the soil and which maintains homeostasis. Garden of Life actually trademarked the phrase, as it has no real relevance in scientific terms. While some of their microbes may in fact be sourced from soil, there is no significance to their term. and enzymes from S. boulardii. There are four forms of this supplement, powder, kids'powder, capsules (Ultra) and caplets. The adult products seem to have the same species but in different orders, so no conclusions can be generally drawn about all of the products..
What are the Other Ingredients in Garden of Life Primal Defense HSO Formula? No other ingredients for the powder are listed on their website. For the powder; other websites list silicon dioxide (anti-caking agent), bacterial proteases, and probiotic cultures. For the caplets: calcium carbonate, sodium croscarmellose (an emulsifier, see below), silica (flow agent), magnesium stearate (vegetable source flow agent), rice maltodextrin (anti-caking agent), vegetable coating, bacterial proteases, probiotic cultures. Other websites say that "production of enzymes utilizes wheat, dairy and soy." 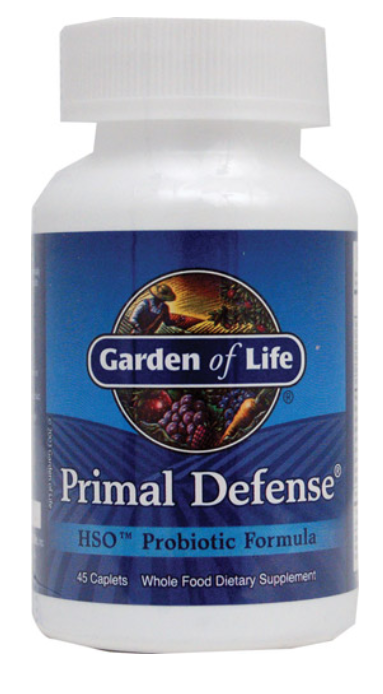 What is the Recommended Dosage of Garden of Life Primal Defense HSO Formula? For the powder and the caplets, the suggested use is for adults to take 1 scoop (1/3 teaspoon) OR 1 caplet 3 times per day with 8 ounces of water or juice, preferably on an empty stomach. It is recommended to begin with 1 scoop per day and gradually increase to the suggested amount. 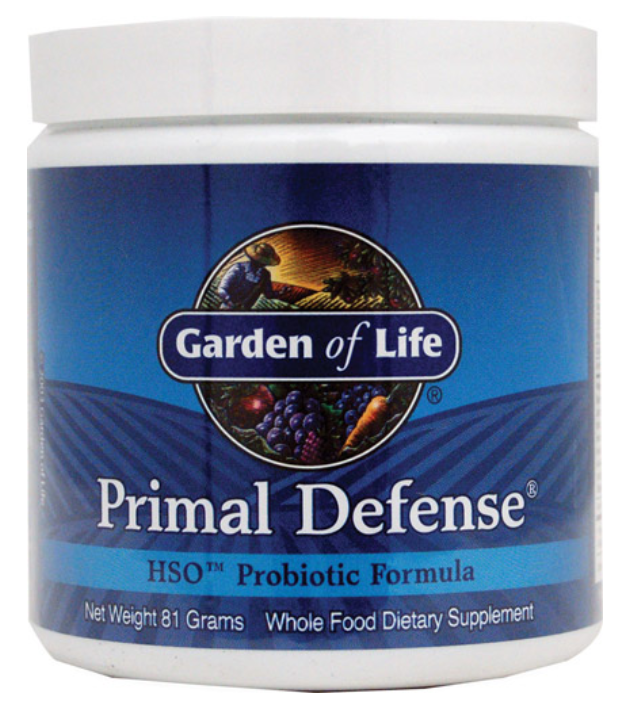 What are the Pros of Garden of Life Primal Defense HSO Formula? What are the Cons of Garden of Life Primal Defense HSO Formula? Since neither the strains nor the amounts of each strain are listed, it is not possible to predict what effects this product will have. The production of the enzymes utilizes wheat, dairy and soy. (Wheat, dairy, soy, barley grass and oat grass are possibilities, so multiple allergy/gluten alerts!) Although Garden of Life says that culture mediums are generally consumed during the fermentation process, there is always the chance of residues of these allergens. Both the powder and caplets deliver 3 mg of iron. While this amount may be insignificant to some people, people who must watch their iron intake, particularly middle-aged women and men and people with hemachromatosis should be aware of this amount in their total dietary intake. The caplets contain a significant number of additives. Compared to other multi-species probiotic supplements, you really don't know how many CFU you are getting. Where to Find Garden of Life Primal Defense HSO Formula? Primal Defense HSO Probiotic CAPLETS in 45, 90, 180 or 216 caplet sizes from Vitacost.com. Primal Defense Ultra HSO Probiotic CAPSULES in 60, 90, 180 and 216 capsule sizes from my online dispensary, along with other quality products, at a discount. 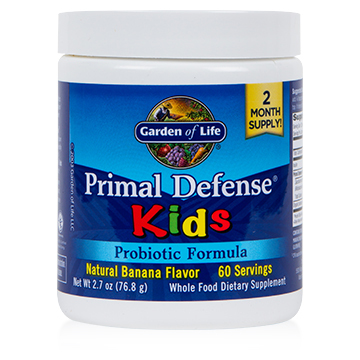 Primal Defense Kids' Probiotic Formula from Vitacost.com. Primal Defense HSO 81 g powder from Vitacost.com. Is Garden of Life Primal Defense HSO Formula the Right Supplement for YOU? If you would like help in determining if Primal Defense HSO Formula is right for you, please consider nutritional consultations with me. A supplement is just that: supplemental to other healthy lifestyle factors. A supplement should not replace good eating habits and taking care of oneself and nutrition consultations can certainly help with those. Thanks to Ward for suggesting a review of this supplement! "Jo, Thank you for your detailed analysis. Your work was unbiased and helpful for me to better appreciate the contents and purpose of the product. I have had satisfactory results from this product and will continue to use it. I appreciate your response, Ward!